The True North Youth Foundation’s (TNYF) Project 11 will expand to include Grades K-4 curriculum for the 2018-19 school year, in addition to the Grades 5-8 curriculum, which has been available to all Manitoba teachers since 2014. Project 11 is seeking a minimum of 50 teachers in each of Grades K-4 to pilot the early years curriculum. Registration is now open to all Manitoba teachers for both early and middle years programs. Project 11’s early years curriculum is inspired by the Vancouver Canucks’ Fin’s Friends Program. The two organizations have collaborated to exchange early and middle years curriculum to effectively expand programming in each region. 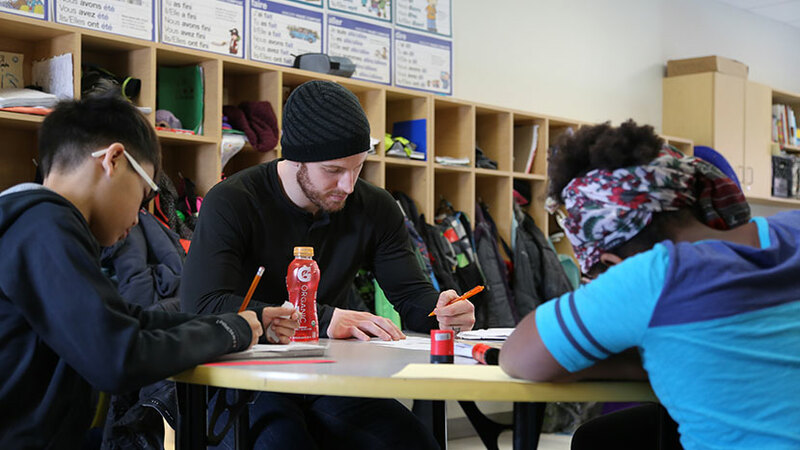 Project 11’s K-4 lessons have been tailored to meet Manitoba curriculum standards as well as to introduce the theme of Jets and Moose hockey. Mick E. Moose plays prominent role in the lesson plans and activities of the early years curriculum, which focuses on character building, problem-solving, and healthy friendships. The 2017-18 school year saw more than 500 educators from 200 schools implement Project 11 in Grades 5-8 classrooms across Manitoba. This translates to more than 11,500 students who are discussing mental wellness more openly, and who have gained skills and strategies that will allow them to cope more effectively with challenges and stress throughout their school, personal, and future work life. Feedback on the Grades 5-8 program has been overwhelmingly positive from both teachers and students. Teachers have observed that students are more connected with their peers, more motivated to excel in all academic areas, and that there is an increased sense of community within the classroom. Students credit the program for helping them to better manage their emotions, be more open with friends and family, and for teaching them about the importance of balance in life. Project 11 continues its partnership with Healthy Child Manitoba to assess the program and its benefits and impacts to participants. Project 11 curriculum is easily incorporated into teachers’ yearly plans and targets Manitoba’s English Language Arts and Physical/Health Education outcomes. Participation is free and the program is open to all Manitoba teachers from Grades K through 8. Teachers can register at projecteleven.ca/registration. Teachers who are continuing with the program are also asked to re-register for the new school year. Project 11 was introduced in 2013 in memory of Manitoba Moose and Winnipeg Jets player Rick Rypien. The initiative aims to carry on Rypien’s legacy by removing the negative stigma and the fear of judgement that can accompany mental wellness issues and by empowering youth to be better connected to their own social, emotional, and physical wellness. To learn more about Project 11, please visit projecteleven.ca or watch this video.